HistoryGeo.com is an interesting subscription site that enables you to see public land-related information on a map with functionality to show you how the land changed over time. Until recently, the site contained only land information from two publications — Arphax Publishing’s Family Maps and Texas Land Survey Maps — including 2.4 million people seen through thousands of maps. But in August 2013, HistoryGeo.com released the First Landowners Project. The First Landowners Project allows users to see more than 7 million landowners’ names and information on one master map. 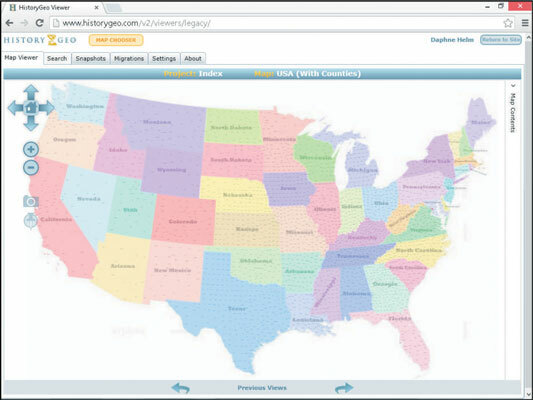 Initially, this new and improved HistoryGeo.com site contains data for 17 states. Over the next few months, HistoryGeo.com plans to release data for all 23 western states, so this number will grow substantially. The First Landowners Project is available only to subscribers, but the legacy functionality of the HistoryGeo.com site is available through a free demonstration account. Click the Register Your Demo Account link at the top of the page. Complete the online form, providing your e-mail address; your password (which you confirm by typing a second time); first, middle, and last names; name of your hometown and state; and your gender. The free account allows you to view HistoryGeo.com videos in the training library and access how-to articles. Click the Original HistoryGeo Viewer (Legacy) link. If you get a pop-up message indicating that some functionality has been disabled as a result of HistoryGeo’s move to the new version of the site, click OK. The original viewer launches, showing a map of the U.S. You can navigate the map using the up, down, left, and right arrows on the right of the map, and you can zoom in or out using buttons just below the arrows. Click the Map Chooser button at the top of the screen. 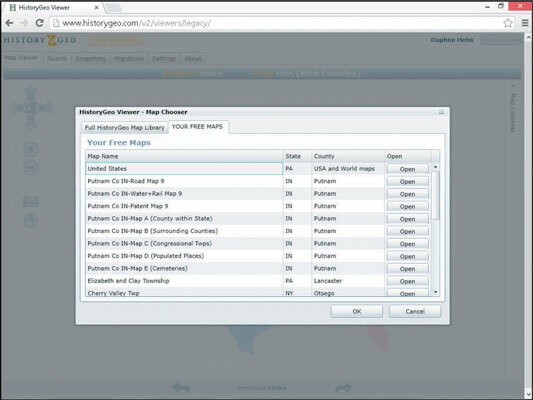 A list of the maps, which are available for use, pops up. Highlight a map in the list, and then click Open. 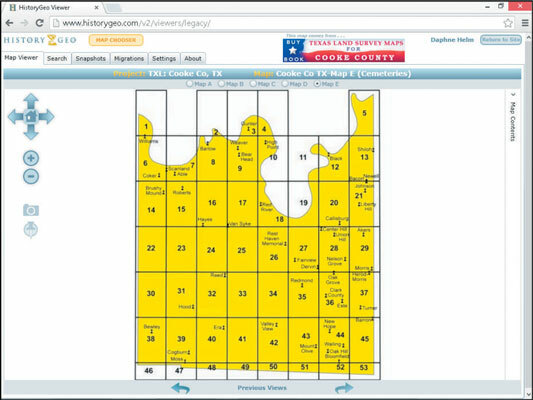 For this example, select Cooke Co TX-Map E (Cemeteries). This brings up a cemetery map for this county. A message pops up informing us that this is a survey map, and a link in the message navigates to a website with more information about the Texas Land Survey Maps. Click the close (X) button on the pop-up message. Although the free registration won’t allow you to see all of the maps in the collection, you can conduct a surname search (on the Search tab) to see how many results you’ll generate for a surname you’re researching. The list provides the locations with the map names. This may give you an indication whether it’s worthwhile for you to subscribe to HistoryGeo.com to get access to the more detailed information. The new version of the HistoryGeo.com viewer — known as the First Landowners Project — is available only to subscribers. The functionality is quite handy though, so it warrants a closer look. The First Landowners Project enables you to search by surname the original owners of public lands in the U.S. You can also restrict the search by state and county, if desired. In examining this site, search for Matthew’s ancestor, Jacob Helm, in Illinois. The results contain numerous Helms, but you know Jacob lived in Fayette County, so you can home in on him and his brother rather quickly. 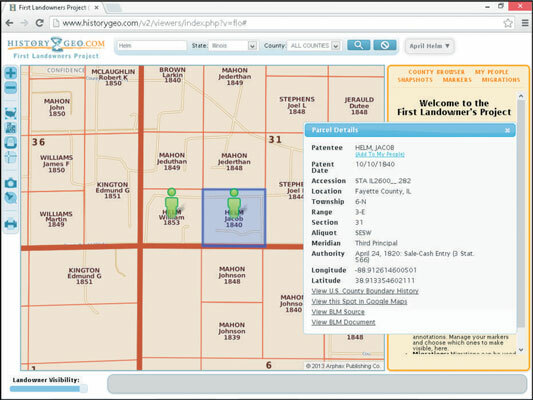 Then, by clicking the green person icon, you see details about the land parcel and even connect to an image of the original Bureau of Land Management document. In addition to being able to see information about the piece of land, you can add markers on the map to indicate events in your ancestors’ lives, save people to your list of favorites, and plot migration patterns for multiple ancestors or families at a time.